The Coca-Cola Company manufactures, distributes, and markets nonalcoholic beverage concentrates and syrups worldwide. It principally offers sparkling and still beverages. The company is member of the S&P 500, Dow Jones Industrials and the S&P Dividend Aristocrats indexes. Coca-Cola has paid uninterrupted dividends on its common stock since 1893 and increased payments to common shareholders every year for 47 years. From the end of 1998 up until December 2008 this dividend growth stock has delivered a negative annual average total return of 2.10% to its shareholders. The stock has largely traded between $65 and $40 over the past decade. The company has managed to deliver a 10.90% average annual increase in its EPS between 1999 and 2008. 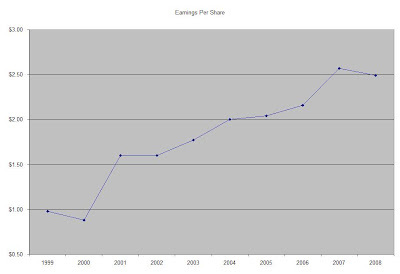 Analysts are expecting an increase in EPS to $3.05-$3.10 for 2009 and $3.25-$3.30 by 2010. This would be a nice increase from the 2008 earnings per share of $2.49. Future drivers for earnings could be the company’s tea, coffee and water operations. Cost savings initiatives could also add to the bottom line over time. Some analysts believe that Coca Cola could follow arch rival Pepsi Co’s moves to acquire its own bottlers in an effort to gain more control over the production and distribution of its beverages in key markets. Coke holds a 35% interest in its largest manufacturer and distributor of Coca Cola products, Coca-Cola Enterprises In. (CCE). Coca-Cola Enterprises Inc. accounts for about 40% of Coke’s concentrate sales and 16% of the company’s worldwide volume, which makes it a likely target of acquisition, should Coca Cola decide to follow Pepsi Co’s strategy of buying back its bottling operations. 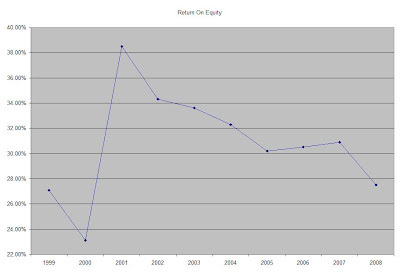 The Return on Equity has been in a decline after hitting a high in 2001. Rather than focus on absolute values for this indicator, I generally want to see at least a stable return on equity over time. Annual dividends have increased by an average of 10.10% annually since 1999, which is slightly lower than the growth in EPS. The company last raised its dividend by 8% in February 2009, for the 47th year in a row. A 10 % growth in dividends translates into the dividend payment doubling every seven years. If we look at historical data, going as far back as 1969, The Coca Cola Company has indeed managed to double its dividend payment every seven years on average. I believe that The Coca Cola Company is not as attractively valued at the moment as Pepsi Co. I would consider adding to my position there if it can cover its dividends at least two times by its earnings by the end of the year, and if the P/E ratio doesn’t increase above 20.